Definition at line 248 of file control-command.hpp. Definition at line 275 of file control-command.cpp. 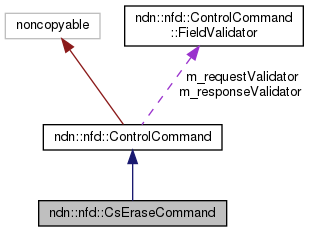 References ndn::nfd::CONTROL_PARAMETER_CAPACITY, ndn::nfd::CONTROL_PARAMETER_COUNT, ndn::nfd::CONTROL_PARAMETER_NAME, ndn::nfd::ControlCommand::m_requestValidator, ndn::nfd::ControlCommand::m_responseValidator, ndn::nfd::ControlCommand::FieldValidator::optional(), and ndn::nfd::ControlCommand::FieldValidator::required(). Definition at line 288 of file control-command.cpp. References ndn::nfd::ControlParameters::getCount(), ndn::nfd::ControlParameters::hasCount(), and ndn::nfd::ControlCommand::validateRequest(). Definition at line 298 of file control-command.cpp. 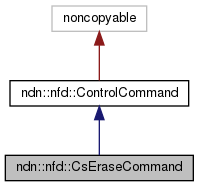 References ndn::nfd::ControlParameters::getCapacity(), ndn::nfd::ControlParameters::hasCapacity(), and ndn::nfd::ControlCommand::validateResponse().